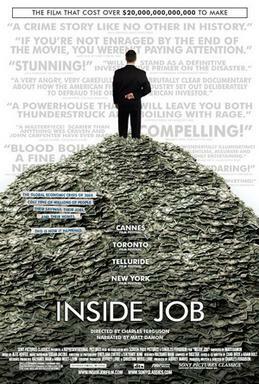 Perhaps the most important movie of 2010 was Inside Job. If you thought Michael Moore's Capitalism was interesting but don't like his particular antics, this is a remedy. It tries to describe the financial meltdown of 2008. As I type this, I think about the comments I made about Waiting for Superman in the last post. But I choose to ignore that. While I think I have a better picture of what happened to the economy, I still don't understand derivatives. The movie does a fine job of trying, but I don't get it. But somehow, I think that's the point. They seem to be nothing more than banking slight of hand. You need to see this movie. 127 Harry Potter and the Deathly Hollows was pretty much what you expect. If you liked the previous six, you'll watch it. If you didn't, you can skip it. For me, I have the dumbest criticism of it ever, but it's how I feel about it. The movie feels... incomplete. Well, duh. But previous movies designed to be continued later, such as Kill Bill and the Lord of the Rings felt like full movies. I was satisfied with those while looking forward to the next movie. I didn't get that here, and I think that's a result of the source material having been only one book. However, i loved the book. I think when the second part comes out, I'll almost consider it as one full movie, and I have a feeling that it's going to make the 2011 list. 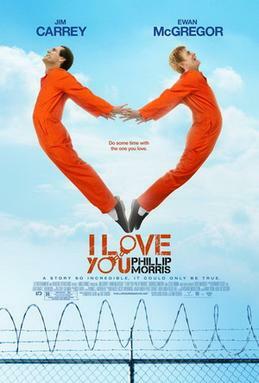 I think it's important that you don't know anything about I Love You Phillip Morris before going in. I didn't know the real story, and it's a good one. There are twists and turns that seem improbable, and the more amazing ones were real. Jim Carrey is great and worth seeing. Black Swan was interesting, but I can't go much beyond that. It turns out that I wasn't ready for a movie about ballet - who wudda thunkit? There are some cool visuals and the music from Swan Lake is great. But I didn't care for the story or what was going on. Tangled is really good. It's cool that there are so many good animated movies out there. In fact, two made the top ten list. This one is funny, looks good, and is entertaining for everyone. It doesn't panders to kids. Tron: Legacy looks really cool. My biggest complaint about the visual is that in the original the good guys were lit up in blue and the bad guys in red. The update has the bad guys in red and the good guys in white. On one hand, it gives the movie a bit of a black and white look. But that's not what Tron should be. The plot? Who cares. Some stuff happened leading them to some cool looking things. I have a strong, strong feeling that if I didn't like the original, I would have hated this. But then again, I probably wouldn't have seen it. 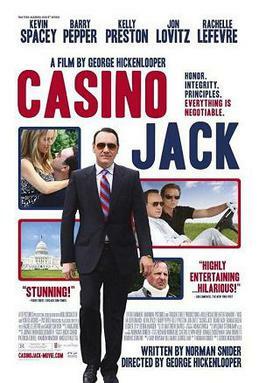 Casino Jack is the story of Jack Abramoff. Kevin Spacey is great in the lead role. He turns Abramoff into a real movie character. It's a pretty entertaining story. I'm surprised the movie got made as quickly as it did, since it seems like this stuff just happened. But it's probably a story worth telling because things don't change quickly in DC. Somewhere feels like a really long version of its trailer. That's not necessarily a good thing. But after having a few days to absorb it, it's an interesting movie. There are some scenes and visuals that have stuck with me. It seems like the type of movie that I could see come on TV and I would watch for about 10 minutes or so. But then I would remember that it's a fairly boring movie. Very confusing. All right - tomorrow I'll write about some movies that will be sort of an introduction to the top ten. They're movies that either could have made the top ten or ones that just surprised me. Then on the first, number 10.